Much of our contracted orders are based on top quality 80% wool 20% nylon contract Axminster and Wilton carpets. However, we also supply and fit other floor coverings including vinyl's, non-slip safety flooring, carpet tiles and wood block. In recent years, a fast-growing part of our business has been our ability to create bespoke designs for businesses who wish to assist in the development of their finished Axminster product. Our ability to weave your company logo or motif into your carpet proves to be a successful method of promotion for your business and a fundamental part of driving your brand image forward. We offer all of our customers a personal service. 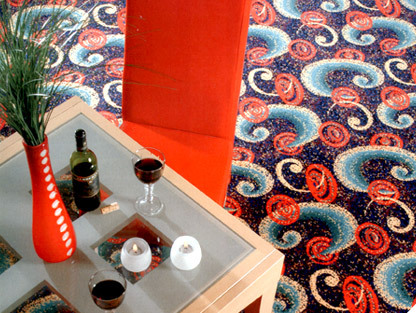 We carry out an initial inspection of the premises then offer our professional expertise along with recommendations on the type of carpet or flooring required. A detailed competitive quotation will then be prepared to include the manufacturing, supply, delivery and installation of your chosen product. Alternatively a supply only quotation can be provided.